"Don't call me a sick person, because sick people don't live the way I live," says Jamel Donaldson, a self-described "health nut" whose relentlessly positive outlook has helped him to stay fit and focused since starting dialysis two years ago. Donaldson – whose kidneys failed in 2011 due to an inherited disease called Alport Syndrome – isn't relying on positive thinking alone to maintain his health. Since he's not currently employed, he's finding time to exercise at least four times a week, and watching his diet carefully. His exercise regimen starts with running and weight lifting. 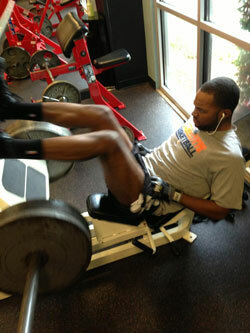 He concentrates his lifting on different muscle groups each session, then lets those muscles recover for several days. He also enjoys boxing with his brother and tries to play basketball at least three days a week. "I'm in better shape than the guys I play basketball with," he boasts. Donaldson, who dialyzes at home every night to allow more time for daytime activities, makes sure to eat before working out. He also pays careful attention to his fluid levels while at the gym, where he tends to get dehydrated. He understands that eating and drinking the right foods, in the right amounts, is key to staying healthy on dialysis – even if it sometimes means giving up certain foods that he used to love. Instead of soft drinks, for instance, he's learned to substitute lemon- or cucumber-infused water. He's also avoiding processed foods and eating more vegetables these days, sometimes blended into juice. "If you don't have a good diet, you won't get the results you want," he says. He advises other dialysis patients to keep up with their prescribed medications, to follow their doctors' advice and, most importantly, to stay positive. "It's all about your state of mind," he says. "If you can't motivate yourself to overcome this obstacle, it's going to be hard in life for you to do anything. I would never let this turn me into a failure."